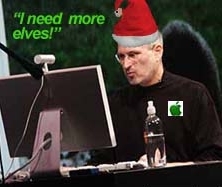 Being Christmas Eve and all, El Jobso has decided to allow the stock price of Apple to close today at an all time high of $209.04, up 6.94 points (3.43 percent.) Today was a shortened trading day. Trading was fueled on reports developers were told to create versions of their iPhone apps that will run on a larger screen, in time for an event next month. Well, well.